VIDEO OF THE WEEK: Larry Sanders Gone Wild!! 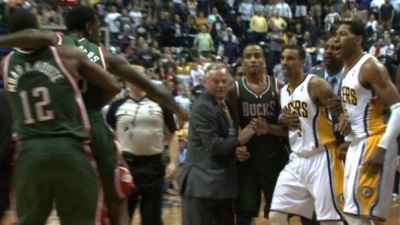 (VIDEO):With the Indiana Pacers up 107-94 with 3:29 left in the 4th quarter against the Milwaukee Bucks, Larry Sanders runs over Danny Grainger and then has a verbal confrontation with George Hill. That’s followed by Sanders and David West jawing at each other, resulting in Sanders poking West in the face. Grainger, attempting to defend Hill, then takes a swipe at Sanders who goes berserk and runs after Grainger.